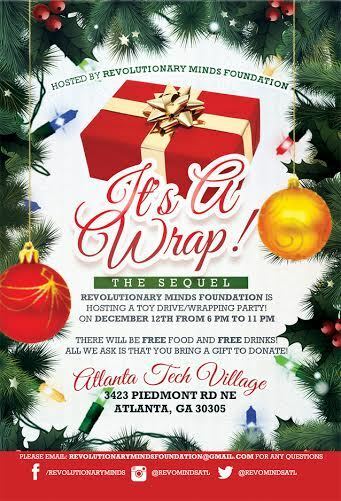 To help with this wonderful endeavor, we are sponsoring the “It’s A Wrap!” party at Atlanta Tech Village on December 12th from 6-11pm. There will be free food, open bar, a DJ, movies, and more, to entertain you as we mingle and wrap gifts. How do you gain entry? Simply bring at least one unwrapped gift. That’s it! Please RSVP to the Facebook event listing to help the coordinators plan accordingly for the crowd. Working together, we can make this holiday season special for those that so desperately need a little hope and happiness during this time of year. We look forward to seeing everyone on the 12th.